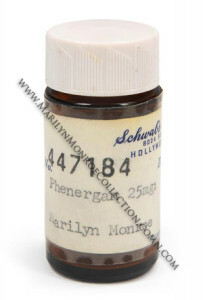 Below is a list of items in this collection that formerly belonged to Marilyn Monroe. These pieces include a prescription pill bottle and eye drops, a set of drinking glasses, her personal collection of film and gossip magazines, and even a light that hung in her Brentwood home. Click on a link below for more information. Most of these pieces come directly from the Marilyn Monroe estate.